Okay, so here's a recipe that is a Thanksgiving staple in my home. It's a MUST-MAKE no matter what for my DH. He loves this recipe. 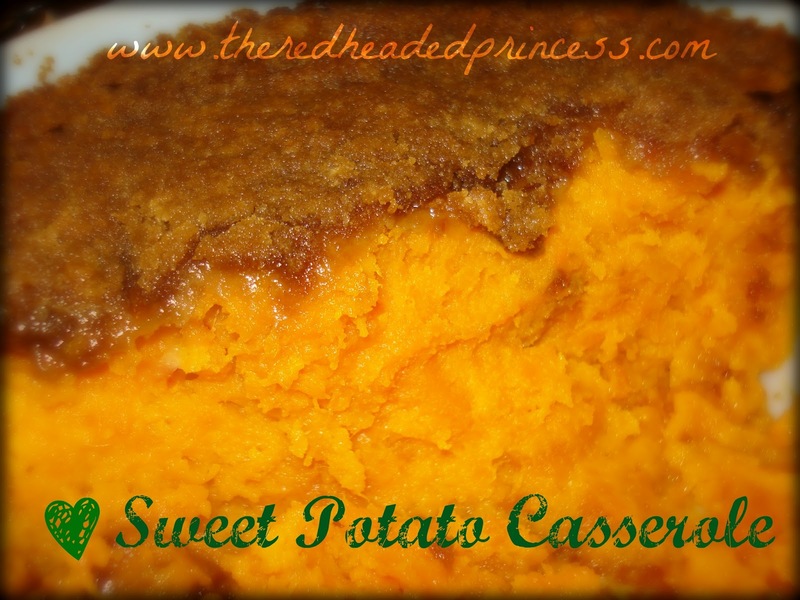 Most sweet potato casseroles have a marshmallow topping and while I do like those, I really love this brown sugary crust much better. Preheat oven to 350 degrees Fahrenheit. So first thing is first peel your sweet potatoes. I used these two huge sweet potatoes and they were plenty. If you see my cutting board it's about 15 inches wide and the one was almost that long. Then cut the potatoes up small. The smaller they are the quicker they'll cook. Don't boil the water first. Rinse the potatoes and put them in the pot. Fill with water till just covered. Add salt and cover with a lid. This will help to quicken the boiling process. Cook over med-high heat. When the water begins to boil, take off the lid so that it doesn't overflow. The water is pretty starchy so just like with pastas, water will boil over if a lid is on the pot. Next drain the potatoes and put back in the hot pot. This will help dry them out so that there is not too much excess moisture. Mash potatoes but don't over mash unless you like it to be pretty smooth. I like my sweet potatoes to have lumps (but not my mashed potatoes). Add the milk, butter, sugar and vanilla. Stir gently. Next we want to temper the eggs. Since the potatoes are hot, if we add eggs now then we'll have scrambled eggs mixed in our potatoes. Gross. SO first put your eggs in a bowl and beat with a fork or whisk. Next add a tablespoon of the sweet potato mixture and mix. Do this a couple more times to bring the temperature of the eggs up slowly. Now add the eggs to the sweet potatoes. Mix together gently. In a small mixing bowl mix the flour and brown sugar. Cut in the butter using a pastry blender or two knives until resembling coarse crumbs. Pour brown sugar evenly over the potatoes. Bake in a preheated oven for 30-40 minutes until the brown sugar forms a crust. Okay, so it's time for your tip of the week! Aren't you excited? Well, a friend shared this article with me and I thought I'd pass it along. 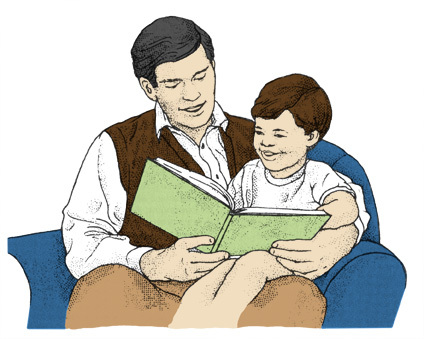 It's from the New York Times and talks about how reading to your kids can improve their scores in school. DH and I try to do this already . However, sometimes life is so hectic and can be hard to find a minute to just sit down period let alone sit down and read a book. When it was just Princess8 in the house we had all the time in the world (or now it seems), but now with 3 princesses in the house it's a juggling act to get to each of them equally. We don't read every night, but try at least a couple times a week. Actually, I am able to read chapter books with my Princess8 which I LOVE since I myself am a bit of a bookworm. We read Nancy Drew and the Clue Crew series and now are reading The Indian in the Cupboard. Princess5 loves anything pink and girly so she is on a Pinkalicious/Purplicious kick. She also loves Princess Sparkle and Fancy Nancy. Princess2 loves Elmo and Blues Clues but really, she loves anything we make interesting. So, maybe this will give you a little motivation to read to your kids. We aren't perfect by any means but I am glad to know that this really helps. Okay, so when I think of "Comfort Foods" this is the meal that comes to my mind every time. I remember growing up in North Carolina and we'd have Sunday Supper at my bff's (Amy) house. Her mom made some pretty awesome Chicken n dumplins among many others (though I was never a fan of lima beans...sorry Miss Terry) It took me quite some time to come up with a recipe that I loved. This meal takes a couple hours and some lovin but it's so worth the effort! Enjoy! 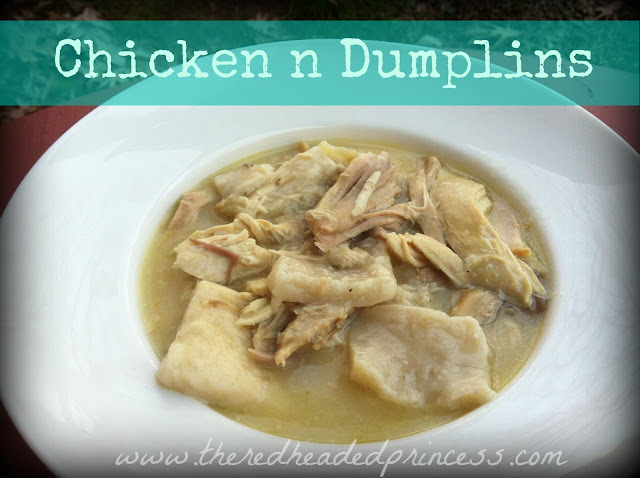 How do YOU make your chicken n dumplins? First remove the giblets and the neck from the chicken. Unwrap and place in the stock pot. I usually cook these along with the chicken because it adds flavor to the stock. Next rinse the chicken inside and out. Place chicken in a dutch oven or large stockpot. Add onion, garlic, bay leaf, celery, carrots, salt, pepper, rosemary, thyme and water. Bring to a boil. Remove chicken from the broth and cool. Remove giblets and neck. Discard. Strain out onions, celery, garlic and bay leaf, leaving only broth. Remove the skin from the chicken. De bone the chicken. Cut into bite-sized pieces or just use your hands to break it apart. Skim fat off the top and then bring broth to a boil. Then add a little bit of flour water to act as a thickener. You want it to be thick and runny with no lumps. Add it to the broth at this point. Just a tablespoon or so of the liquid. Stir. Meanwhile, mix together the flour, baking soda, salt, and chicken bouillon (or poultry seasoning). I only add a little. It's not supposed to overpower the dumplins, just add flavor. The jar on the right is my jar of bacon drippings. I save them for use with this meal and soups, cornbread, anything really....it just adds another layer of flavor. Using a pastry cutter or two knives, cut in the bacon dripping and shortening until incorporated and looking like coarse crumbs. Add buttermilk and mix together. Knead dough 4 or 5 times. OR do what I do now, and roll the dough out to 1/4 inch thickness. Sprinkle with salt and pepper and gently pat it down so the salt and pepper stick. Cut in 1 to 1 1/2 inch squares. It doesn't have to be perfect. I used to make the drop dumplins but now you can see I have been rolling them out. I like the squares better. They're not as thick and seem to cook a little better. Reduce heat to med-low and cook 10 minutes. You want the dumplins to begin to set so that when you put the chicken back in they don't break apart. Using a wooden spoon, gently stir in the chicken. Simmer on low for 20 minutes. Serve it up on a cold day and everyone will love it!